The recent spate of injuries to Philadelphia Flyers defensemen has raised some legitimate concerns in the Mecca Of Minor League Sports that the Lehigh Valley Phantoms could have one of their own rearguards recalled by their National Hockey League parent club even before the first puck of the upcoming 2016/17 American Hockey League season is able to be dropped. It certainly is thought-provoking to consider which player the Philadelphia Flyers might promote if Manning ends up being classified as not fit for active duty. Kram tells me that many in the Philly sports media somehow think that Samuel Morin would be the most qualified candidate should the Flyers feel the need to bring up a defenseman from Lehigh Valley but I think such a notion is downright ludicrous. As has been the case time and time again over the course of his brief career in the AHL, the clearly underachieving Morin failed to establish a dominant physical presence and had difficulty clearing the puck out of his own zone successfully during the exhibition contest versus the Charlotte Checkers at the PPL Center in downtown Allentown on Saturday night. People who have already ready the “Phantoms Roster Projection : Defensemen” article that was published a couple of weeks ago on September 25th will notice that the above list differs slightly from the original forecast. Perhaps not so surprisingly, pre-season injuries in training camp have had an impact. Aside from Del Zotto going down, it was also difficult to anticipate that returning AHL veteran Mark Alt was going to injure his shoulder in a fight during the NHL exhibition contest between the Philadelphia Flyers and the New Jersey Devils at the PPL Center back on September 28th. Nevertheless, it does seem as if the AHL door, if only for a limited period of time, has been opened for two defensemen who were among a trio of rearguards originally projected to be sent down to the ECHL’s Reading Royals. 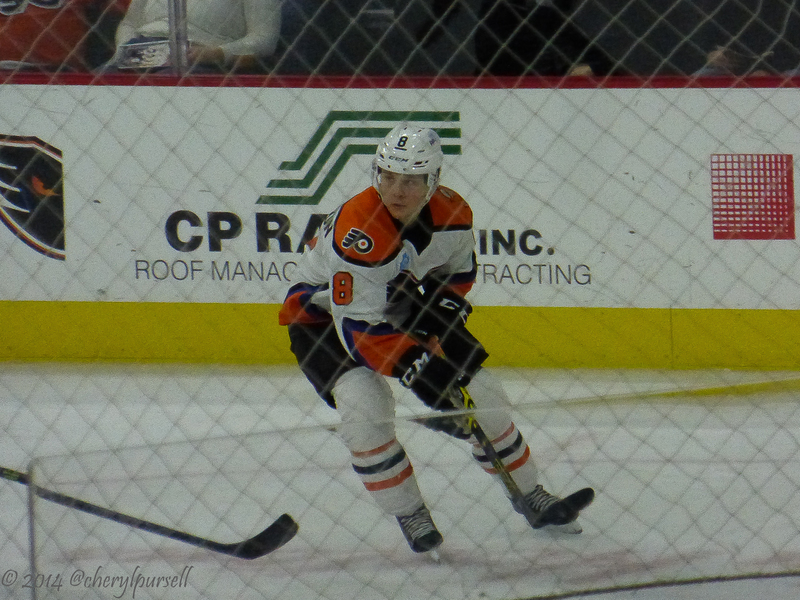 Jesper Pettersson (5’9″ 189 lbs) is the best skater of the three as well as the most experienced with 75 career AHL games in his pocket so the 22-year-old Swedish import could very well make the Lehigh Valley Phantoms’ opening night roster for the third consecutive season based on that. Reece Wilcox (6’4″ 205 lbs), the 22-year-old rookie from Cornell University who was the fifth round pick of the Philadelphia Flyers at the 2012 NHL Draft, got his feet wet with Lehigh Valley last spring and, significantly, was the only one of the three ‘borderline’ defensemen to have appeared in both of the Phantoms’ AHL exhibition games against the Charlotte Checkers this weekend. Maxim Lamarche (6’3″ 217 lbs) is the most physically prepared of the three to bang along the boards and does have the experience of 48 career games in the AHL but the undrafted 24-year-old native of Quebec is still not a bad bet to be dispatched to Reading. On the other hand, there does not appear to be all that much of a difference in overall quality between Pettersson, Wilcox and Lamarche so it will all boil down to what the Lehigh Valley Phantoms coaching staff (read, Philadelphia Flyers organization) decide to do. One might also bear in mind that, unlike in the NHL, there are no restrictions on the number of players any given American Hockey League team can carry on its regular season roster. The news now that Gudas could receive a significant suspension–he was offered an in-person hearing–and the Phantoms could lose another blue-liner temporarily. Given the temp nature of the call, and the fact that the first-rounders have quite high NHL salaries, I’d think perhaps TJ Brennan for that job. We’ll see tomorrow I guess–as well as if forward Weal passes through waivers. Aside from the fact that Brennan has 53 career NHL games under his belt whereas the two first round NHL Draft picks Morin and Sanheim have a combined total of zero games worth of experience in the vaunted NHL, the 27-year-old veteran is, in fact, the cheaper option, as well … Brennan has a two-year contract that pays a base salary of $ 600,000 for NHL service this season and $ 650,000 for NHL service next season (which is why his “cap hit” figure would actually be counted as $ 625,000) whereas the underachieving Morin has a contract that pays an NHL base salary of $ 832,500 for this season and the promising Sanheim has a contract that pays an NHL base salary of $ 925,000 for this season. The official cap hit figure for both Morin and Sanheim is actually $ 863,333 —- a number which is, of course, still higher than Brennan’s. Bottom line as far as Lehigh Valley Phantoms are concerned is that it appears as if the three “borderline” defensemen — Pettersson, Wilcox and Lamarche — need not worry about packing any bags bound for Reading just yet.